Bilateral negotiations between the two countries were first held in 1980 but no agreement was reached. In 2008, Peru took the case to the International Court of Justice(ICJ) which, in turn, considered the issue at a public hearing in December 2012. The ICJ is expected to make a ruling on the dispute in mid-2013. In the meantime, Peru continues to argue that the maritime border has not yet been defined by any agreement, with documents signed in the 1950s only relating to access to fishing grounds. Lima also claims that maritime limits should run diagonally south-west from the land border. Meanwhile, Chile argues that the maritime limits were agreed upon after the signing of treaties in 1952 and 1954. These infer that the maritime border should run parallel to the Equator line, an arrangement that Santiago claims Peru has respected for the past 60 years. El Perú y Chile, pese a las diferencias históricas, comparten un destino común. Un fallo equitativo por parte del tribunal permitirá poner fin al “único asunto” fronterizo que genera una sombra en nuestras relaciones bilaterales. Resulta tranquilizador el hecho de que el presidente Humala y el presidente Piñera, 72 horas antes de iniciarse la fase oral hayan hecho una declaración conjunta, en la cual se comprometieron ambos a acatar y ejecutar la sentencia de la Corte Internacional de La Haya. Despite historical differences, Peru and Chile share a common destiny. A fair outcome by the court will end the “sole remaining border issue” which compromises our bilateral relations. It is reassuring that 72 hours before the start of the hearing (Peruvian) President Humala and (Chilean) President Piñera have made a joint statement in which both pledged to accept and follow the determination of the International Court of The Hague. The dispute between Chile and Peru also has direct implications for others states around the region. In particular, Bolivia is closely watching legal proceedings, and has previously stated[en] that it plans to make a case at the ICJ for Chile to provide coastal access to the Pacific that was lost during the 1879-1881 between the two countries. The final outcome at the ICJ case may add further impetus to Bolivia’s attempts to seek a diplomatic solution to this longstanding issue. Regardless of the ICJ resolution, the democratic and diplomatic statements made by all parties have significantly reduced the risk of armed conflictbetween the parties. La controversia marítima de Perú y Chile, puede llegar a una posible solución instaurándose […] la Zona Marítima de Participación Bilateral la cual dividiría los mares de ambos Estados y que sería destinada a la pesca, […] es decir, la explotación de los recursos vivos por embarcaciones de hasta cierto tonelaje de los pueblos del Perú y Chile. Por ejemplo Argentina y Uruguay mantienen un tratado parecido a esta forma que delimita sus mares soberanos. 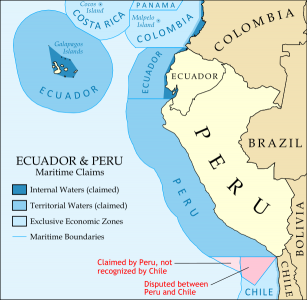 The maritime dispute between Peru and Chile, can reach a possible solution by a so-called Maritime Zone Bilateral Involvement or Participation, which divide the seas of the two states and would be intended for fishing, […] the exploitation of resources by boats of a certain tonnage from both Peru and Chile. For instance, Argentina and Uruguay hold a treaty like this so that delimits their sovereign seas. Córdova also considers that such an alternative could give both countries the chance of exploring and benefiting from mineral, oil and other resources. He is also confident that the Maritime Zone Bilateral Involvement could provide alternative options for Bolivia’s coastal aspirations.